While I recognize that memorizing all of those codes can be difficult for cashiers and it can’t be easy telling whether that bag of apples has a dozen galas or fujis, I think that painstakingly tagging every individual mushroom in the store is going a little overboard. Not only do labels not stick to mushrooms all that well, but I can’t imagine that it’s very efficient to pay some poor stocker to sit over boxes of mushrooms all day long with a label gun. And as with all tagged produce, the worst part is standing in the kitchen removing all of the labels. 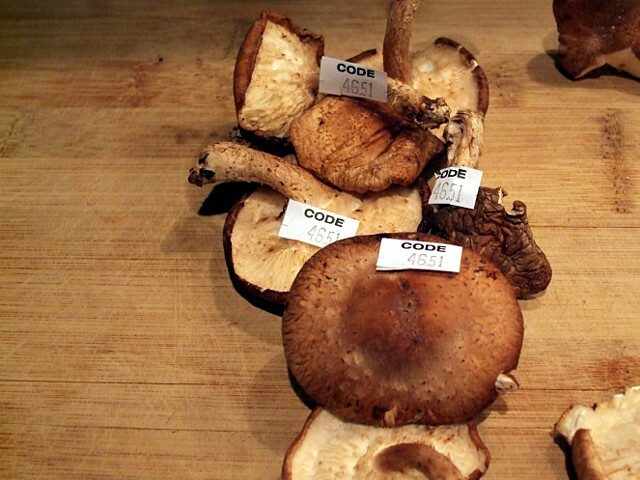 Good thing those printed codes save me five seconds in line; I can apply that time to the two minutes I have to spend standing over the cutting board de-labelling a bag of shiitakes. I try to avoid my local Loblaws whenever possible, but occasionally it’s just too convenient to pass up. I never fail to be surprised by something there, and today was no different. At least they don’t shrink-wrap as much of their produce as the local Sobeys does.